We love what we do; plain and simple. We strategically integrate technology and design to achieve your business goals. AWE, Inc. is the national leader in early education systems in schools and libraries throughout the country and expanding into the global market. 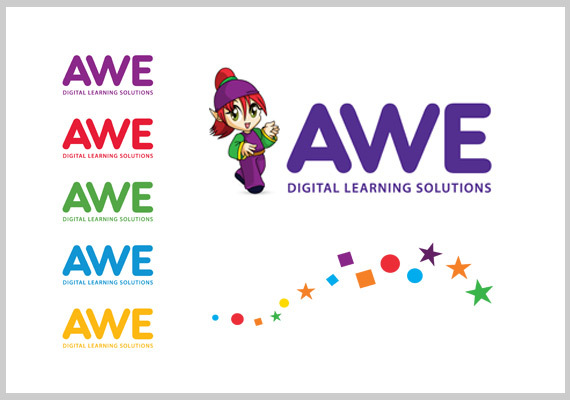 AWE engaged MCG Strategic to provide complete branding, website design, development and content management integration that would ultimately redefine the company's presence in the early-childhood learning market. MCG Strategic is continuing its relationship with AWE by developing an e-Commerce platform and a community-driven social learning platform to accompany their site. Acurian had a unique challenge… to connect potential Crohn’s Disease and IBD study participants with a study center at the exact time of flare up. MCG Strategic provided the engagement strategy, user experience and creative design of a mobile application to track the disease symptoms and identify flare situations. A creative concept to drive daily engagement was required for success. MCG Strategic provided the critical technical direction and expertise needed during the engineering phase to ensure connectivity between the app and the study center databases, while maintaining patient privacy when necessary. 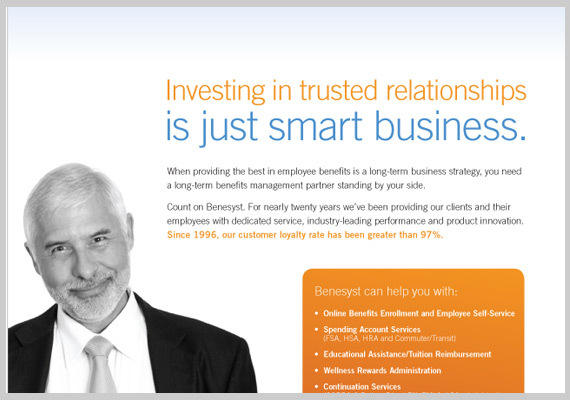 A national leader in benefits management outsourcing, Benesyst was faced with a common challenge. 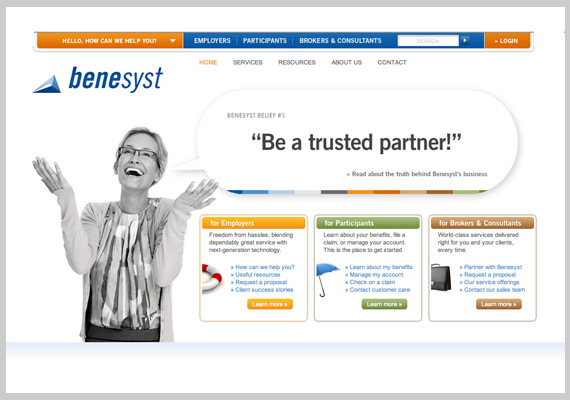 Although touting 18 years of experience and an unmatched reputation for customer service, Benesyst recognized the need to evolve to compete with the technology advances of their competitors. MCG Strategic was called upon to provide a range of services to meet this need—a new marketing website focused on core values of customer service, name and logo marks for new products and services, and an overhaul of their online benefits management platform servicing over 150K users. 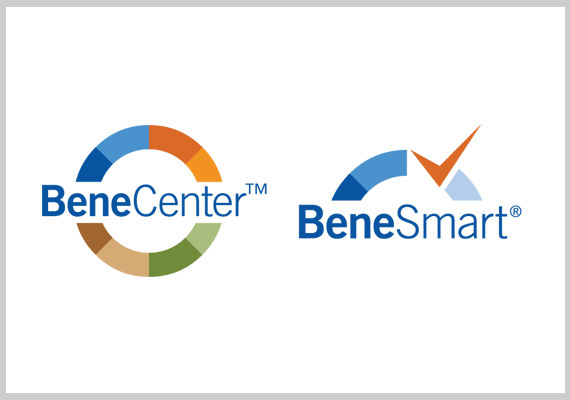 As a result of Benesyst's marketing and business efforts, they attracted and merged with another industry leader, realizing a position of great strength and combined success. 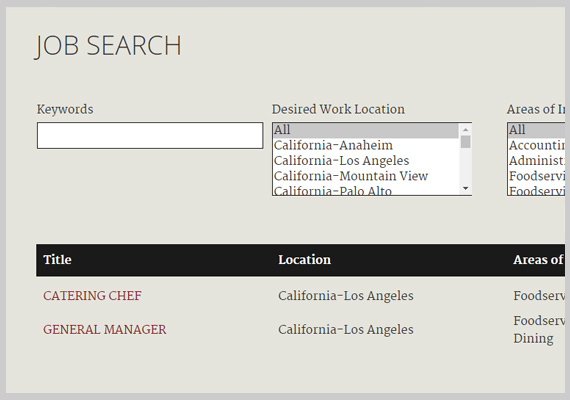 BAMCO— an on-site restaurant company offering full food-service management to corporations, universities, museums, and specialty venues— has an established and effective online presence for attracting clients. But the process for attracting qualified employees was less than ideal. Forced to send potential employees to an external site, BAMCO lost the ability to maintain a consistent experience with their attractive brand. MCG Strategic was asked to integrate a job search capability within the BAMCO site to maintain the brand equity and provide the best user experience for those high-quality employee prospects. Successfully launched for salaried job openings, MCG Strategic will be extending the job search system for hourly openings in early 2018. BROWZ is dedicated to defining the world of contractor compliance. With expert knowledge and intuitive software solutions, BROWZ has quickly moved into a position of global growth as well as product growth. 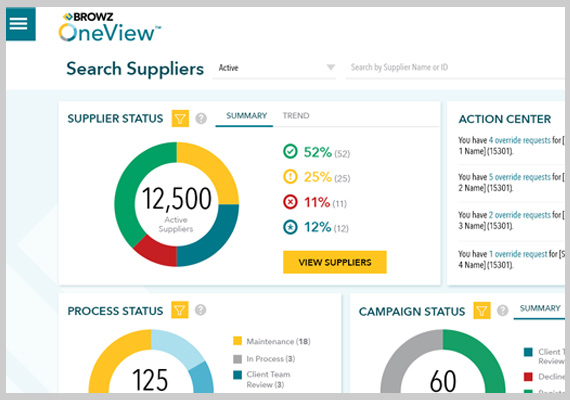 MCG Strategic evolved the brand—repositioning BROWZ products to tell the story of the unique configurability offered to clients and suppliers. A new logo mark, tagline, messaging, product naming, responsive marketing website and marketing materials were launched in September 2014. Within the past three years, MCG Strategic designed and engineered three mobile apps, and branded and redesigned their web-based platform, OneView. Shared databases, connectivity in the field, and accommodating content for over 12+ languages were just some of the logistics that were successfully addressed in this award-winning set of products. MCG Strategic has engineered various solutions for CertainTeed, a world-leader in quality building products. 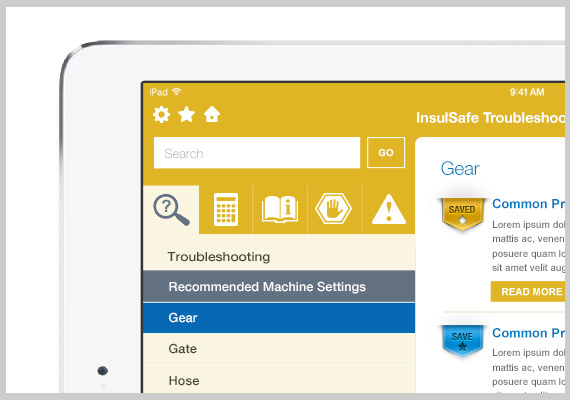 These include a mobile application to assist field installers with easy-to-access, up-to-date safety information and a large online digital asset library to provide sharing of files between marketing partners world-wide. 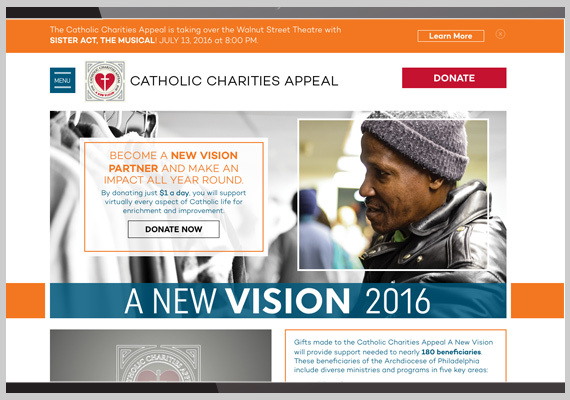 The Catholic Foundation of Greater Philadelphia, a large non-profit organization focused on charitable giving, needed a way to better connect with the community online. 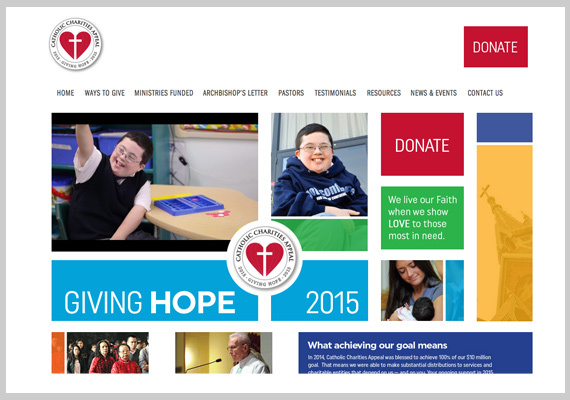 MCG Strategic created a welcoming new website focused on charitable gift-giving and driving participation. 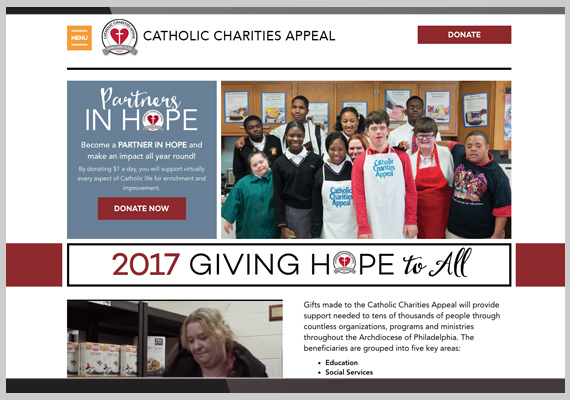 By showcasing donor stories, the site illustrates the breadth of giving in the Philadelphia Catholic community to people of all faiths. While the existing brand was maintained, an evolution of the creative defined an overall clean, open, intuitive user interface, clearer structure and flexible mobile views, enabling a new way to create valuable community connections. 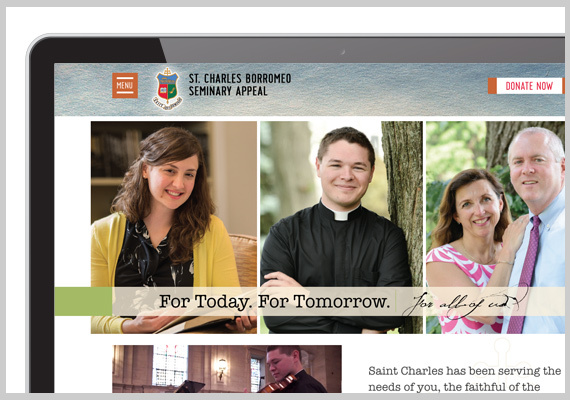 Since site launch, the Foundation’s charitable funds have increased from five to over 28 offerings— an impressive sign of charitable success. 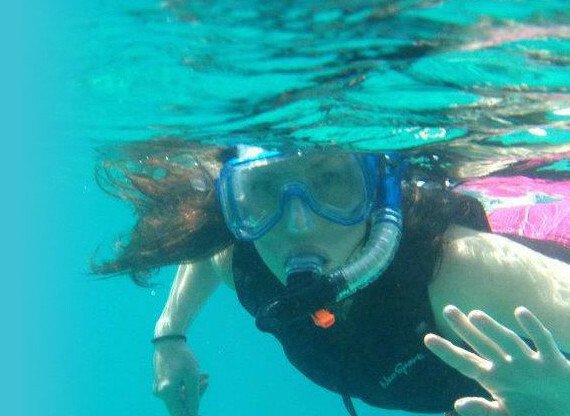 Chartwell Family Oasis has experienced success with the recent launch of their summer day camp program. However, they needed a new website to surpass the competition, while supporting organic local search and marketing outreach efforts. MCG provided a solution that gave them the refreshing look they needed while unifying their back office management platforms and streamlining registration and communication processes. 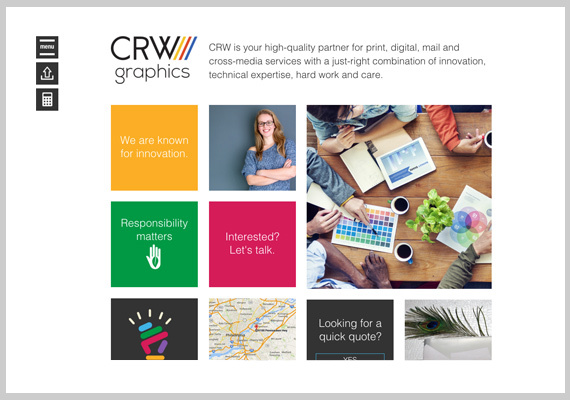 CRW Graphics was ready for a brand shift to position themselves accurately as an innovations company not just providing exceptional quality printing, but with an outstanding capability to meet customer needs through innovative technologies. MCG Strategic designed and developed a new website to communicate their ‘high-tech, hi-touch’ philosophy, demonstrate core values, promote a cohesive family of products and provide an easy-to-use business platform for internal and external users. 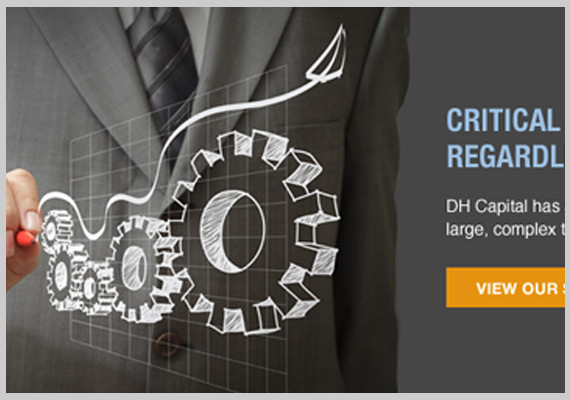 DH Capital, a national investment firm specializing in backing infrastructure, communications and technology needed to up it's game in communicating using technology. Their website gave an impression of experience, but did not have the forward-thinking approach that represented who they were. MCG Strategic created a new brand identity and a modern website that allowed them to easily showcase and manage multiple press releases and transaction tombstones—key in proving their expertise in the field. 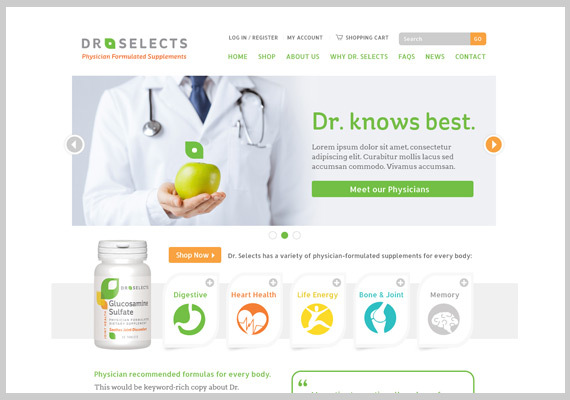 When a prominent Orthopaedic surgeon decided to meet his patients’ questions about nutritional needs by creating his own formulated line of vitamins, he turned to MCG Strategic to help determine the best way to sell online. With unique requirements, such as automatic reordering and simple backoffice invoice/ label shipping, a customized approach was needed. MCG Strategic developed a solution that is robust for future growth, yet easy-to-use and with a clean design that will make ordering a breeze across multiple devices. Exactly what the doctor ordered. What happens when a small jet charter service, an aviation repair business and a aircraft parts service organization decide to merge into one company? They reach out to a partner for help consolidating into one strong corporate aviation brand. With the exciting new brand roll-up, the Volo Direct brand was kept in response to strong brand equity. MCG Strategic designed and developed a fresh, new website to be user-friendly, easy-to-use and showcase parts and services. Strong call-to-actions and opportunities for initiating sales contact were prominently placed. 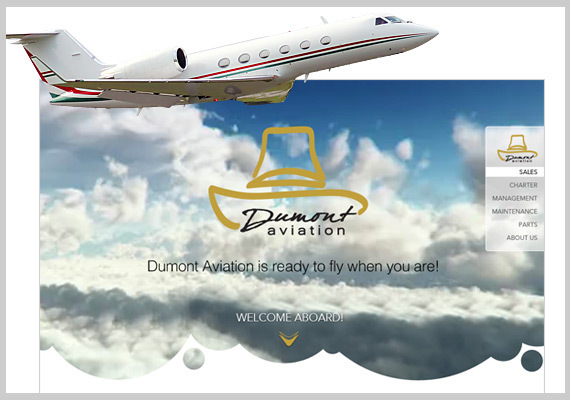 An inviting approach including video and a full browser experience appeals to flight enthusiasts and customers. This new brand has strong lift-off. 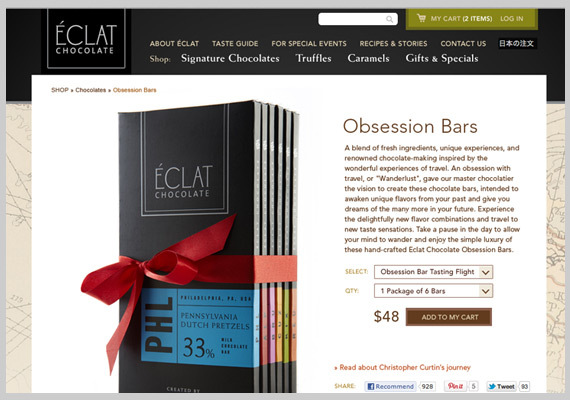 When renowned Master Chocolatier, Christopher Curtin from Éclat Chocolate experienced a surge in attention within the culinary scene, he needed his retail website to support the brand and an increase in sales. MCG Strategic evolved a basic site into an easy-to-manage storefront that reflects the richness of his chocolates along with the influences of his global travels and inspirations. In addition, MCG provided a streamlined and more efficient backend shipping process—a critical effort to ensure the chocolate melts in customers' mouths, not in shipping boxes. Hachik Distributors—a family-owned, 90-year-old business—was ready for a change. Playing in a sea of blue, Hachik believed it was time to stand out from their competition. 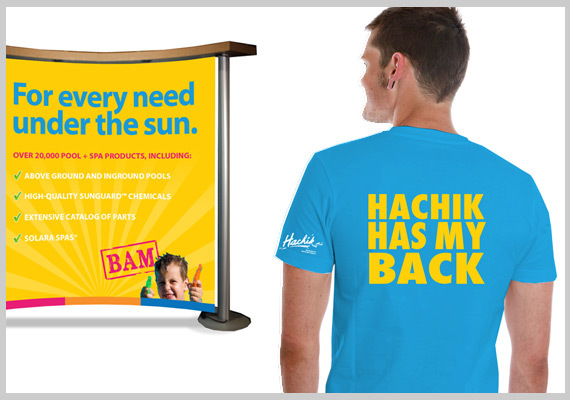 Drawing inspiration from a beachy summertime palette and a strong customer service message, MCG Strategic evolved the Hachik brand across all marketing vehicles. From trade show booths and B2B print ads to an overhauled online ordering system focusing on usability and an interactive sales presentation, Hachik quickly gained attention from customers and competition alike. After decades in the business, they definitely made a big splash. 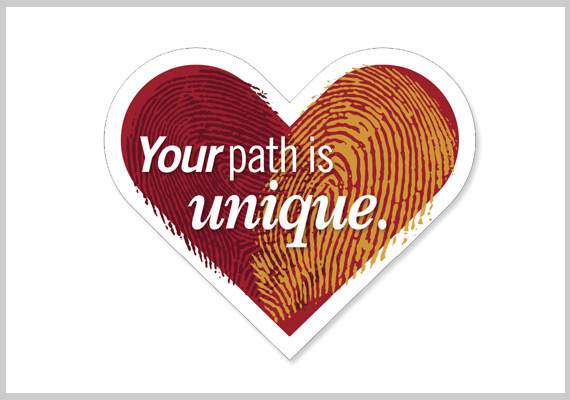 When The Center for Allied Health & Nursing Education decided to seek official college status for their expanding campuses, they came to MCG Strategic for help in renaming the school and creating a new brand, as well as communicating the transition to current students and partners. With five campuses spanning service areas for six states, they focused on the website and SEO as their primary marketing vehicle. Actionable content, search engine optimization and robust analytics were paramount to its success. 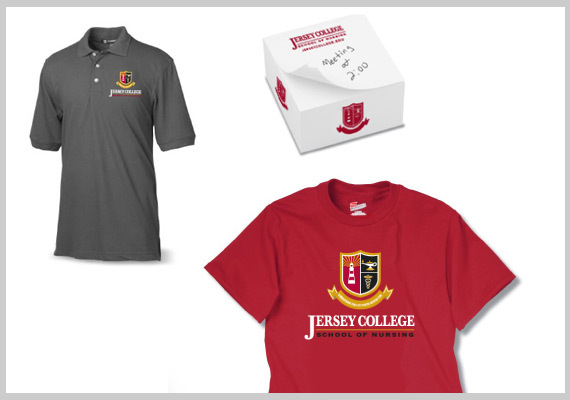 MCG Strategic rose to the challenge—creating Jersey College's new logo, brand, messaging, catalogs, brochures, promotional items, banners, admissions materials and postcards in addition to the mobile-friendly website, email templates and automated online system for routing prospect leads. Enrollment is up. And Jersey College has captured its path to success. We get excited here at MCG Strategic when we can apply custom technology solutions to our business to make it run faster and more effiently. We also sometimes like to experiment, try new methodologies and just be fun and creative. 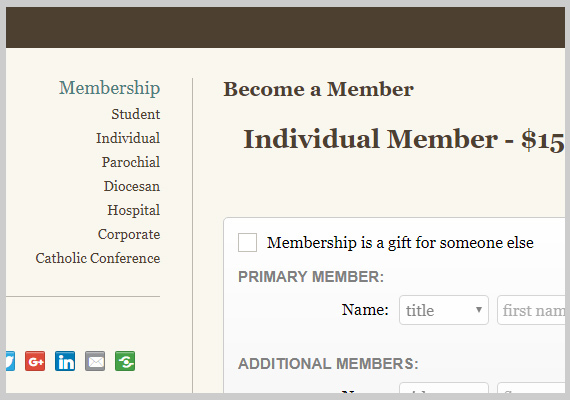 NCBC— an organization that has been providing life sciences and healthcare ethics guidance to the Catholic community since 1976—faced growing challenges in providing online access to their services and resources. With NCBC’s needs outpacing the capabilities of their third-party resource management platform, MCG Strategic designed and implemented a new document management and site membership system that integrates seamlessly with their site and content management system. Enterprise search engine capabilities were added to the site to allow site visitors to conveniently search NCBC’s massive repository of PDF documents. Because access to resources is based on a visitor’s membership status, MCG Strategic implemented a security model to allow public searching of document content, but restricted visitor access to documents without a membership account. When New First Financial Resources needed a better way for associates to share resources and support each other in business, MCG Strategic developed a user-friendly member portal. File sharing, networking, event announcements, and valuable resources provide the members with the support they need to conduct better business across the country at any time, from any place. 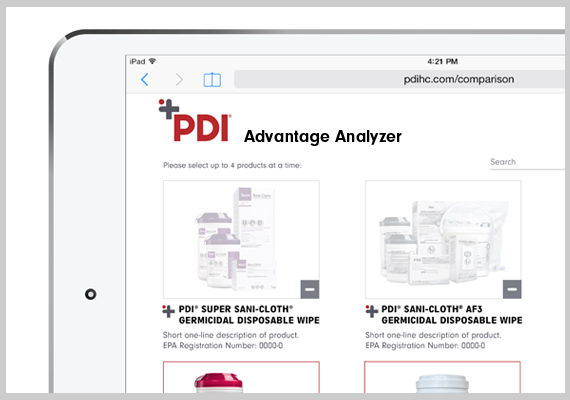 PDI, the industry leader in healthcare infection prevention products, needed a way for their sales representatives to show the superior effectiveness of PDI products compared to equivalent competitor products. MCG Strategic, in alliance with Renavatio Healthcare Communications, designed and engineered Advantage Analyzer— a suite of product comparison tools that provide easy-to-read reports for efficacy, SKU cross reference and surface compatibility for healthcare facility, interventional care and patient care disinfectant products. Sales reps can walk through the app with a client or prospect by selecting the competitor products currently used, and the equivalent PDI product. Resulting comparison reports can be shared via email, a secure link, or as a downloadable PDF. The launch of Advantage Analyzer was a complete success in the organization. The internal excitement led to requests by several other groups within the organization asking for their products to be added to the suite of tools in early 2018. 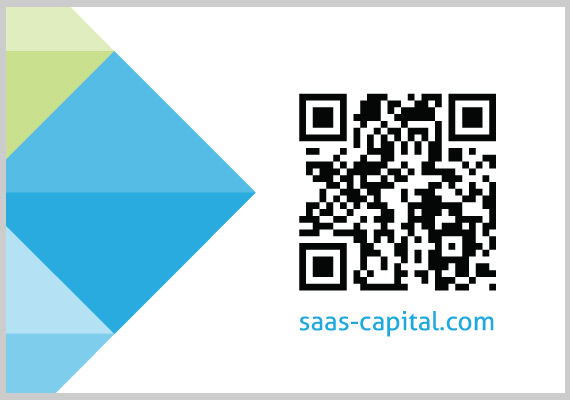 SaaS Capital, an Ohio-based financier focused on technology, needed to launch a site quickly to coincide with their new fund offerings, while creating a new brand for their venture. They turned to MCG Strategic. With a new logo, brand personality and messaging, their site captured the attention of the industry and announced their arrival onto the playing field with just the right tone and messaging. The site quickly became an effective business tool for engaging prospects requiring funding. 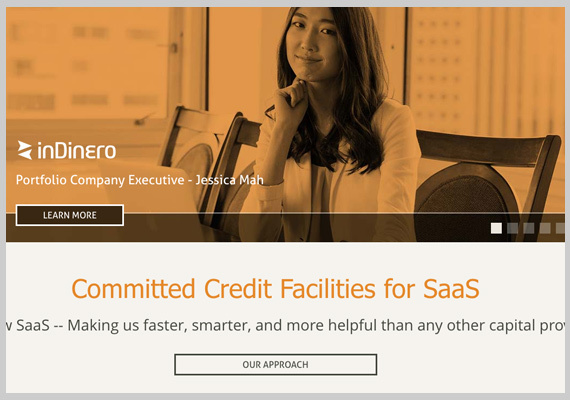 Utilizing Concrete5 for content management, SaaS Capital is able to create and manage their online marketing efforts in-house and with ease. For a large multi-national corporation, controlling employee healthcare benefits costs is paramount. Saint-Gobain introduced the LiveWell program that encourages their employees to live healthier lives. To augment their efforts, Saint-Gobain hired MCG Strategic to design and develop a mobile app that allowed their employees to track various recommended healthy activities on a daily basis. The app communicates with a central database and stores each employee's activity progress for later analysis. This data allows Saint-Gobain to offer rewards and identify employee trends. 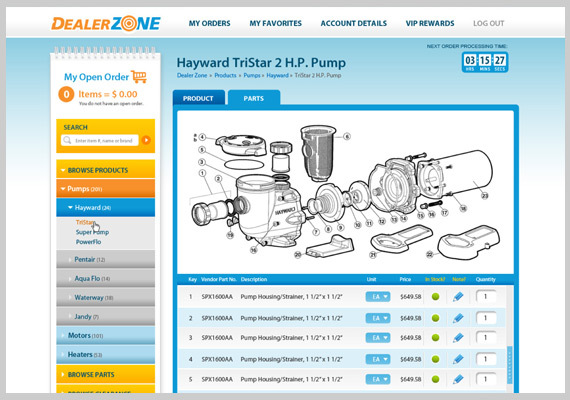 Spinsaver, a Pennsylvania-based business promotion service similar to Groupon, wanted to improve their redemption process for their merchants. 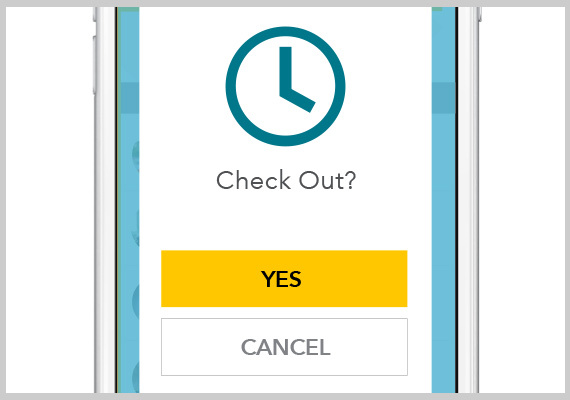 With a new merchant-focused app, developed by MCG Strategic, vouchers are easily redeemed with a quick scan and database check from any iOS or Android phone or tablet device. 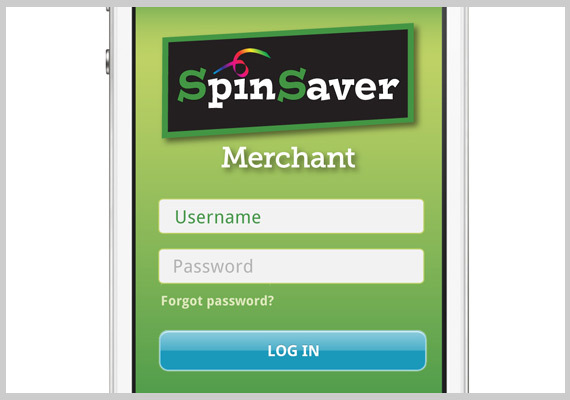 The app has been so well received—consumers asked for their own SpinSaver app - and MCG delivered. Now consumers can view deals, purchase vouchers, and redeem via app-to-app scanning with the merchant app. If top brands need recognition in New York City, they call Synergy Events. In the business for decades, this PR and events promotions agency knows how to pull out all the big stops, but needed a push for their online presence. MCG Strategic delivered with an evolved logo mark and a mobile-friendly, responsively designed site with large, billboard-style images—showcasing the excitement that is Synergy. 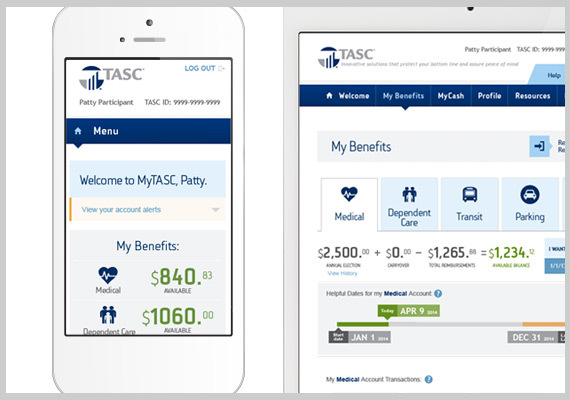 TASC (Total Administration Services Corporation) Inc., a fast-moving corporate player in administration outsourcing, engaged with MCG Strategic to help integrate their multiple benefit platforms servicing over 500,000 users by enhancing and improving user experience to align with specific business objectives. Streamlined focus on the user interface, a user experience design (UI/UX) overhaul and in-depth, smart engineering to interface with TASC’s various databases, platforms and frameworks in a flexible, mobile approach has resulted in a new offering touting increased user and customer satisfaction. TE Connectivity sponsored an exciting development in network connectivity and needed a brand identity and website to launch technical specifications and documentation for adopters of this new specification. MCG Strategic created a vibrant logo and a mobile-optimized site to highlight the features and benefits, and developed an online document repository for members to easily share information. 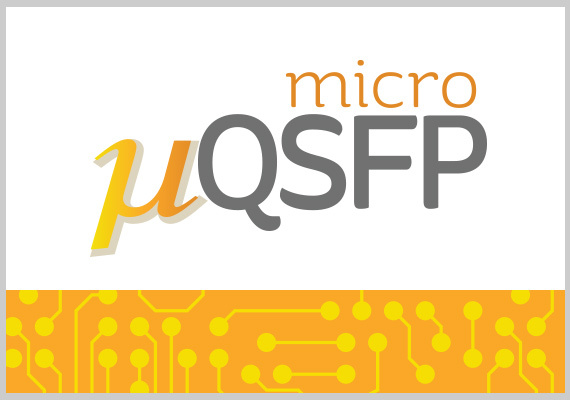 MicroQSFP is now positioned to make a big impact in high-speed data transfer. Ed Satell, a longstanding leader in charitable giving, launched a unique Think and Do Tank that has quickly become a premier resource and knowledgebase for Corporate Social Responsibility (CSR). 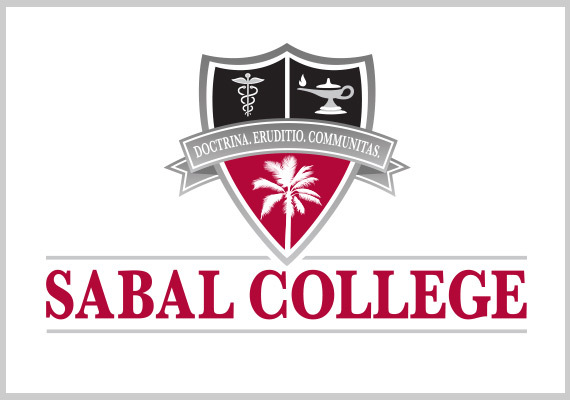 His foundation called upon MCG Strategic to develop a new brand, website and marketing materials to position the Satell Institute as the experts in the CSR field. Strong call-to-actions and opportunities for initiating contact are the prominent focus. A professional, inviting messaging approach, demonstrating Satell’s experience and expertise was used to inform, engage and impact the audience from the outset. Built for growth, the website was implemented with an enterprise content management system that supports Satell’s roadmap for providing membership-based resources, content and corporate mentorship in CSR. 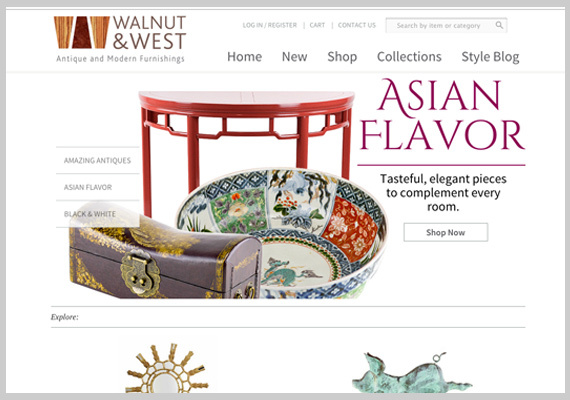 Walnut & West, a brand new online furniture merchant was looking for an e-commerce solution to market to a highly aesthetic customer base, but had unique needs for their sales model. MCG Strategic provided an easy-to-use, mobile-optimized shopping experience with a clean visual design, as well as an intuitive administration section for order management with robust tools for accommodating the requirements of selling diverse types of products. This eclectic mix of antique and modern furnishings is now open for business. 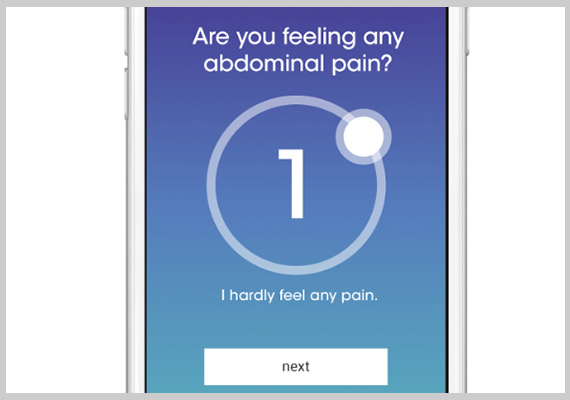 COLO is an engaging app designed for clinical study participants to track their IBD symptoms, manage their disease and get more from the clinical trial. MCG Strategic developed the concepts, functional and technical strategy and user interface for the app. 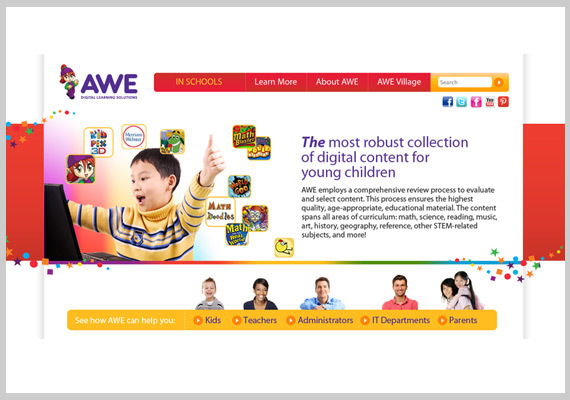 Speaking to multiple institutional and retail customers, this site showcases the innovative educational products AWE provides for children nationwide. By utilizing a robust CMS, MCG Strategic provided an intuitive, efficient system for AWE to maintain their content internally, allowing AWE to focus their efforts on outreach, promotion and sales. Working with photographer Joe Andris, MCG Strategic helped AWE create a library of brand photography showcasing the AWE digital learning systems in the library and school environments for use throughout all marketing materials. MCG Strategic developed a brand system including logo refinement, color palette and font definitions as well supporting brand graphics for AWE. A detailed brand guidelines document was delivered to the marketing team for in-house use and for external partners to follow. MCG Strategic's relationship with Benesyst began with the design and development of a marketing website focused on friendly and helpful navigation models. From highlighting a new brand message and concept, to speaking with multiple audience members and integrating with an intuitive content management system, this website set the stage for further brand explorations. MCG Strategic provided strategy, user experience design and development for a benefits management platform serving multiple clients and brokers and over 150K participant users. 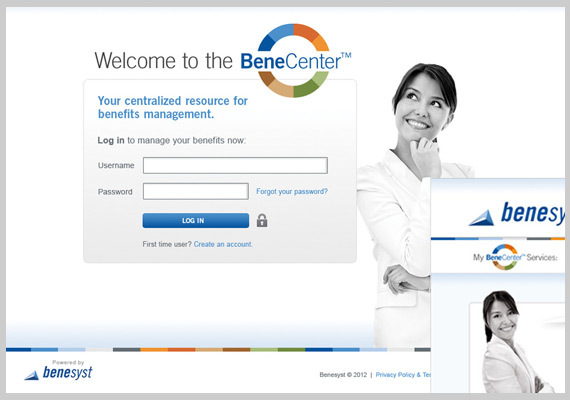 This complete overhaul of their online platform was named BeneCenter™ and was re-engineered from a user-experience standpoint to create an easy-to-use, enjoyable experience of benefits management. Benesyst and MCG Strategic further extended the technology offering to its user base through a complementary mobile app. In tandum with developing a new marketing website, MCG Strategic created new brand concepts and messaging to promote their reputation for excellence in customer service. Personal, testimonial-based messages bring warmth and personality to a technology-focused site via warm, friendly faces and inspirational beliefs. As Benesyst's business expanded, MCG assisted in naming and developing visual design identities for a series of complimentary service product lines. 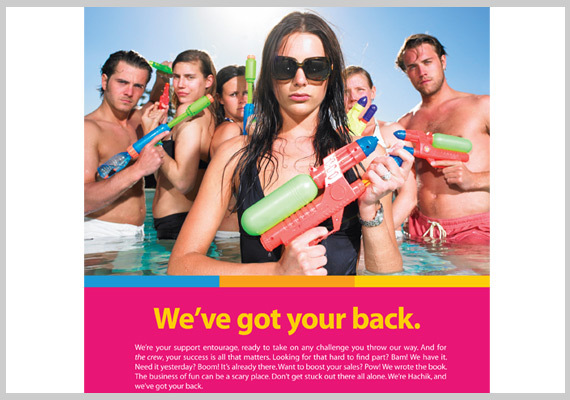 Benesyst's B2B trade ads push their new brand messaging for specific service products. The creative concepts and visuals complemented the online efforts seamlessly, further solidifying their brand and rounding out a cohesive marketing presence. MCG Strategic proposed, designed and developed a mobile application enabling benefits participants to easily submit claims on the go. 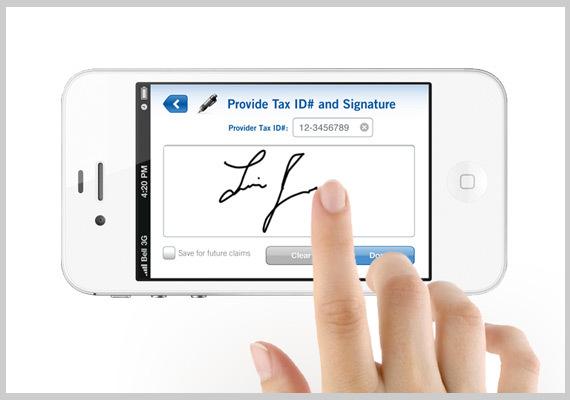 Features include real-time processing of claims, signature and documentation capture and submission. After seeing an employment search engine created by MCG Strategic for a sister company, BAMCO asked for one of their own. MCG Strategic was challenged with consuming an unoptimized data feed to produce clean, searchable data that returned relevant job opportunities for potential prospects. MCG Strategic worked within a highly—customized version of WordPress, creating a plugin that was easily installed and configured by the client. 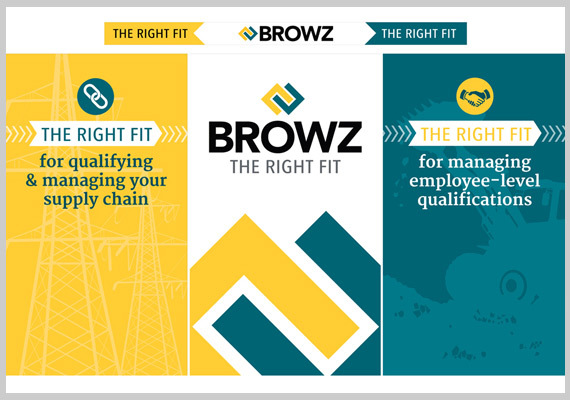 MCG Strategic reconfigured the BROWZ brand—from positioning and messaging to logo mark, tagline, color palette and imagery— to reflect the evolution of BROWZ’s unique compliance products offerings. 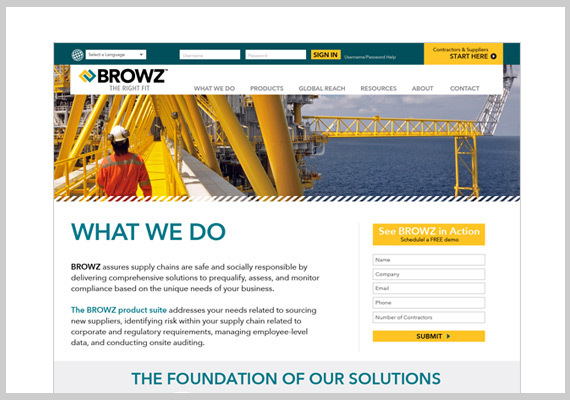 Responsive mobile design in 5 languages with built-in content management ability and ease of use were just a few delivered goals with the new BROWZ.com marketing website. MCG Strategic built upon the success of the BROWZ mobile apps by developing a new product brand and completely redesigning the user experience and interface of BROWZ’s web-based application for contractor, supplier and employee management. Since releasing the new platform in November 2016, launched under the new name OneView, BROWZ has received overwhelmingly positive feedback from current clients, and has experienced significant growth in engaging new clients. BROWZ wanted to ensure consistency across all materials—both visually and contextually. 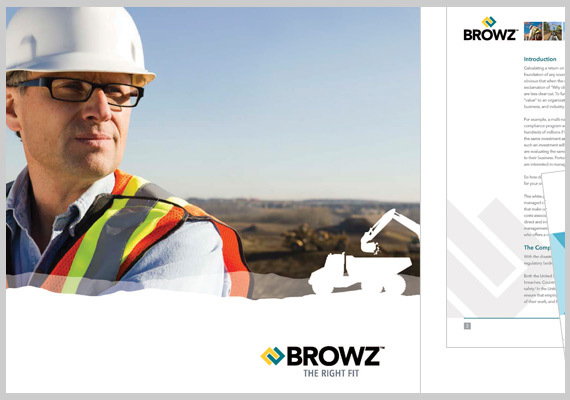 In response, MCG Strategic created a series of print templates including white papers, brochures and case studies to support BROWZ's desire to communicate their thought leadership. Using OneView, BROWZ’s flagship software platform, provides enormous cost-savings for the client. But, explaining the potential ROI to a prospect can be extremely complicated. 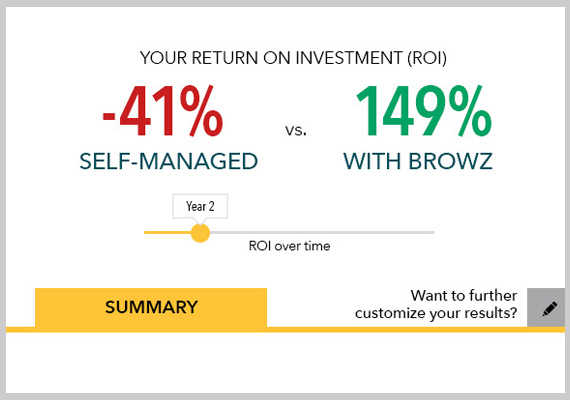 BROWZ engaged MCG Strategic to create an online ROI Calculator that quickly showed the ROI of using BROWZ, in a visually appealing way. 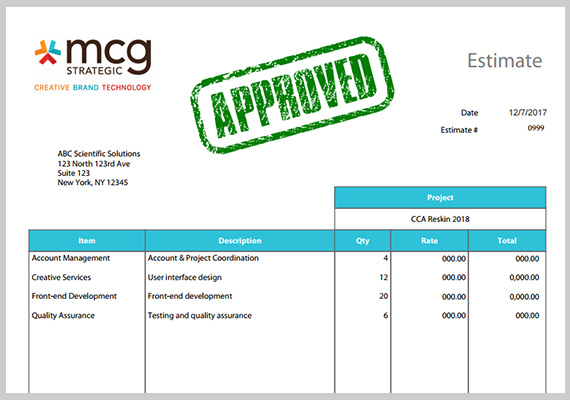 Taking complex formulas from an Excel workbook, MCG Strategic designed and engineered an easy-to-use and easy-to-understand online calculator that allows the user to export the report and share with colleagues for purchasing approval support. 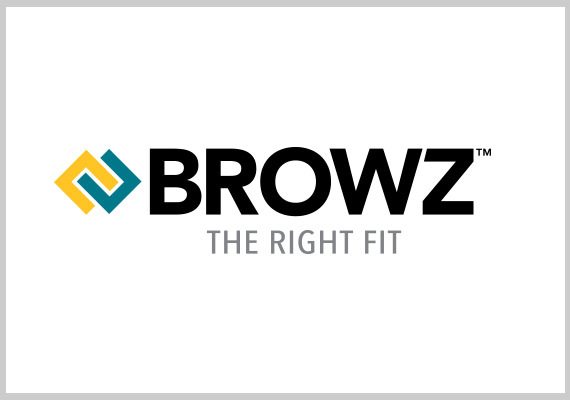 To coincide with the new brand launch, MCG Strategic helped create materials for BROWZ to showcase the new brand. 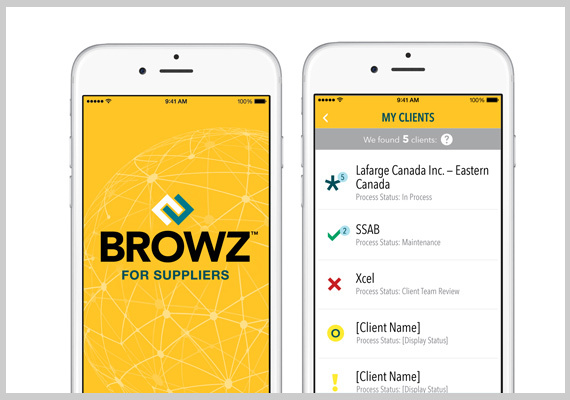 This award-winning app was an industry first for BROWZ in an effort to provide real-time supplier and contractor compliance data to their clients via phone or tablet—often in remote environments. 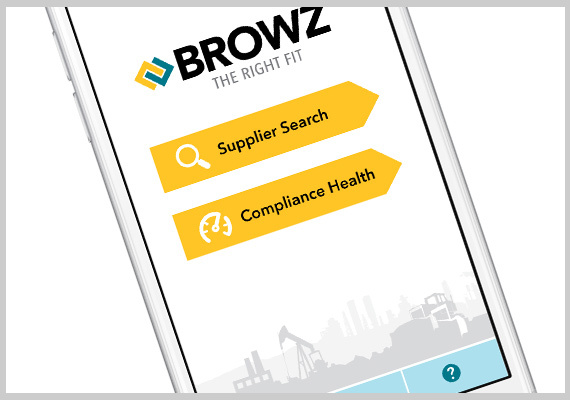 MCG Strategic designed & developed this second app in the BROWZ mobile suite, focusing on the global contractor and supplier audience to provide a real-time view of their organizations compliance status. Translated in five languages and delivered for both Android and iOS, achieving compliance has never been easier. Following in the recent successes of BROWZ’s previous two apps, SURE Workforce™ enables scanning of workers into worksites and allows for employee spot checks to verify qualifications and credentials while on a worksite; an extremely useful new tool in BROWZ’s suite of apps. 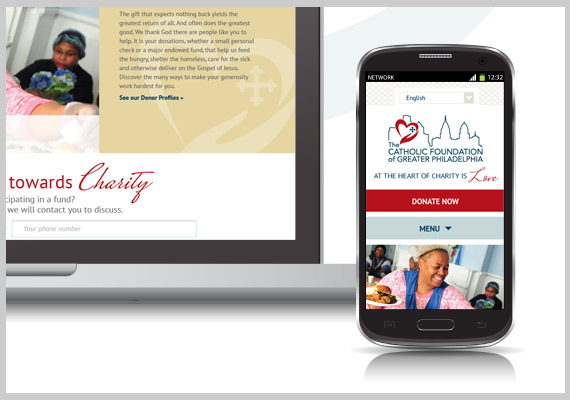 MCG Strategic designed and developed a responsive website focused on a clean, intuitive user interface, clearer structure and flexible mobile views, enabling a new way to create valuable community connections, feature funds and drive donations. 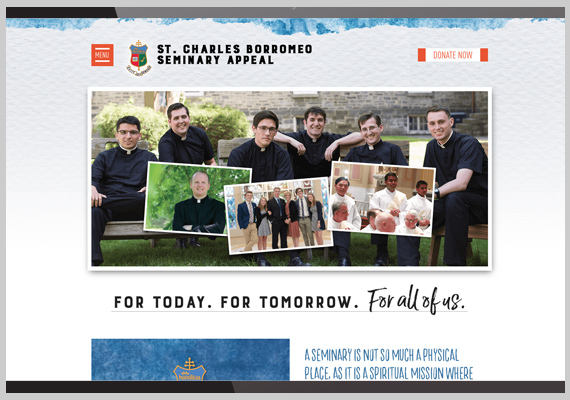 Mobile-readiness, content management, outstanding usability, and engaging video integration were just a few of the requirements for this site built to raise awareness and increase funding. 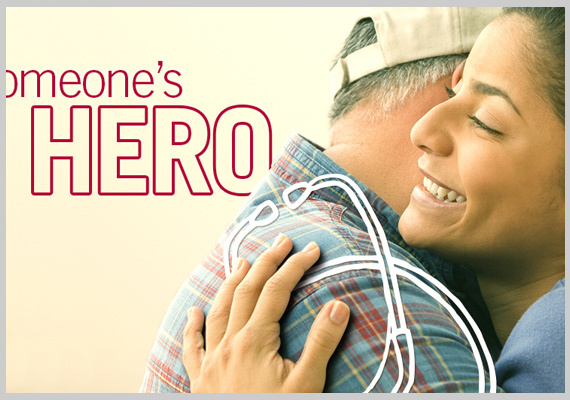 MCG Strategic updated the site with new graphics, colors and styles, while incorporating video, to complement the new campaign creative and keep a fresh approach to donor outreach. MCG Strategic redesigned an outdated site to provide improved visitor usability, mobile optimization and easier content administration. Due to a security flaw in CCA’s WordPress content management system that was affecting their search rankings, MCG quickly converted the site to Concrete5, a more robust and user-friendly CMS. 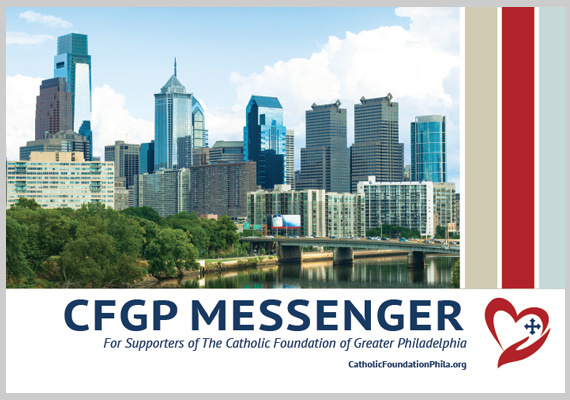 To complement digital efforts, MCG Strategic designed the Spring 2016 Newsletter highlighting CFGP’s events, outreach efforts and successes. 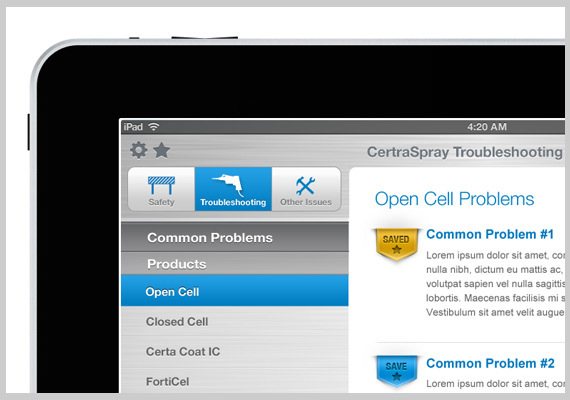 MCG Strategic developed a mobile application for CertainTeed's field installers to guide them through safety procedures, product installation and common problems. The content for this troubleshooting guide changes regularly, but the app needed to work in environments that may not have Internet connectivity. MCG integrated a Web service that pushes content to the device when it has connectivity, storing it for offline use. MCG Strategic engineered an asset management site for CertainTeed's global marketing departments to have easy access to all of their logos, images, etc. 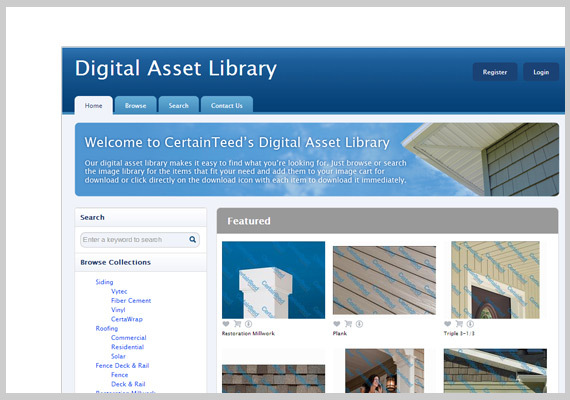 This system tracks all user activity and allows CertainTeed employees and authorized partners to upload new media and create categories or collections. Using ASP.NET MVC3 and SQL Server, the application is designed to be white-boxed and has been licensed to other companies within Saint-Gobain. Expanding on the success of the CertaSpray app, MCG Strategic designed and developed a mobile app for installers of blow-in insulation to access critical documentation and safety procedures regardless of location in the field, and internet connectivity. 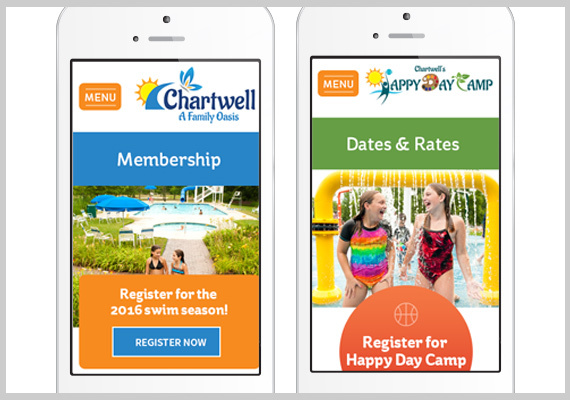 MCG Strategic designed and developed a new website to promote both the Family Oasis and Happy Day Camp, integrating online payment and registration with various platforms to easily market and conduct business. When CRW was ready for a fresh, modern look, MCG Strategic came through with a new tablet-friendly site focused on strong call-to-actions and cross-promotion of services. 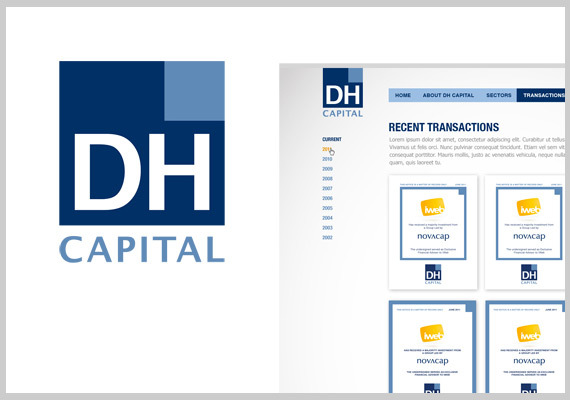 MCG Strategic designed and developed a website to enable DH Capital to easily manage testimonials, press releases and transaction tombstones, along with the ability to present prospects with a fresh, modern, technology-enabled face to their business. When talking financials, it's easy to become static and conservative. 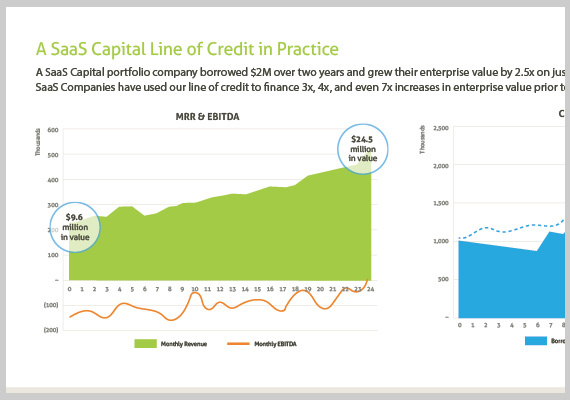 MCG Strategic took on the challenge to create new visual messaging that was grounded in experienced business, while maintaining an air of technological know-how—a must for this technology-focused financier. With unique requirements, such as automatic reordering and simple back office invoice/ label shipping, MCG Strategic developed an e-commerce solution that is robust for future growth, yet easy-to-use and with a clean design that will make ordering a breeze across multiple devices. 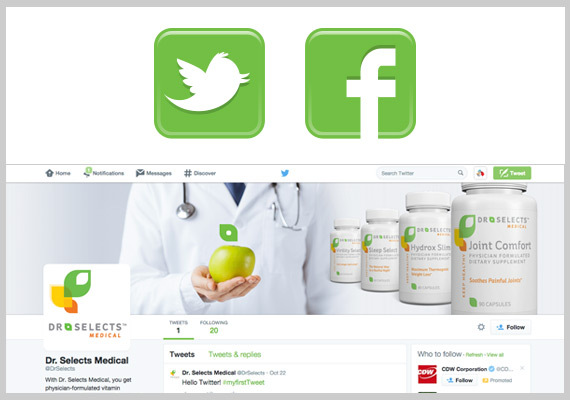 To help support product launch and promotion, MCG Strategic is assisting Dr. Selects in creating social media profiles and plans to drive social engagement through from e-commerce website. MCG Strategic designed and developed a fresh, new website to be user-friendly, easy-to-use and showcase parts and services. Strong call-to-actions create engaging opportunities for initiating sales contact. A full browser video experience appeals to flight enthusiasts and customers, creating strong liftoff for a new, consolidated brand launch. When renowned Master Chocolatier, Christopher Curtin from Éclat Chocolate experienced a surge in attention within the culinary scene, he needed his retail website to support the brand and an increase in sales. MCG Strategic evolved a basic site into an easy-to-manage storefront that reflects the richness of his chocolates along with the influences of his global travels and inspirations. In addition, MCG Strategic provided a streamlined and more efficient backend shipping process—a critical effort to ensure the chocolate melts in customers' mouths, not in shipping boxes. Showcasing their newly updated brand, MCG Strategic worked with Hachik Distributors to create and place multiple print ads in various B2B trade publications. With a strong customer service message and aggressively fun visuals, dealers were quick to take notice. As part of an overall brand evolution effort, MCG Strategic redesigned and developed Hachik's website with the prospective dealer in mind. This marketing site focuses on unique benefits and offerings while introducing their fun brand personality. Built upon an intuitive content-management system, Hachik's internal team is now able to quickly and easily promote news and events, while tracking inquiries through the site. 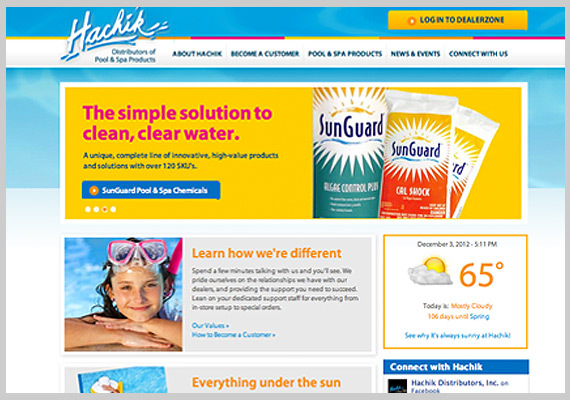 Hachik, a B2B wholesale distributor of pool and spa products, engaged MCG Strategic to re-architect an online ordering system that was ready for a modern upgrade. MCG Strategic analyzed their existing system and designed a solution that would decouple the user interface from the ordering system code, and allow for efficient extensibility, while embracing modern user-interface and browser conventions.By building a middle-tier data translation engine (using PHP, AJAX, XML and XSLT) that prepared and formatted the data from their ERP into a format that the user interface could efficiently translate, MCG Strategic was able to create a new, modern user experience and rapidly deploy a newordering system while retaining their existing internal processes. From booth graphics and materials, to interactive sales team presentations and giveaways, Hachik's trade show presence needed a facelift. Starting with flow diagrams and key marketing objectives, MCG Strategic helped create an environment focused on showing all that Hachik has to offer in a fun, inviting tone. 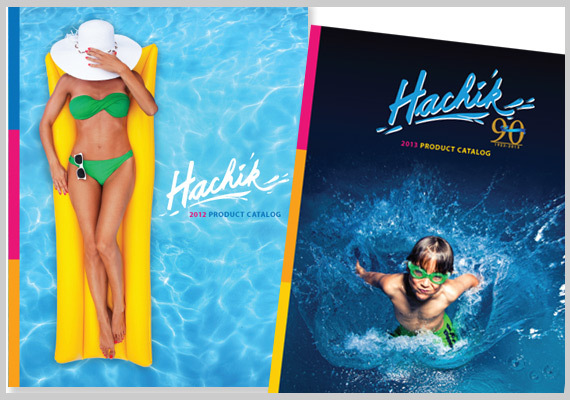 MCG Strategic extended Hachik's new brand to include creative design for their yearly and seasonal product catalogs. It was time to shine after years of the same look. Hachik turned to MCG Strategic for a new, updated product label design for their top quality line of pool & spa chemical products. Six color-coded categories, and 160 SKUs later, new labels hit the shelves and were well received by current and prospective customers alike. 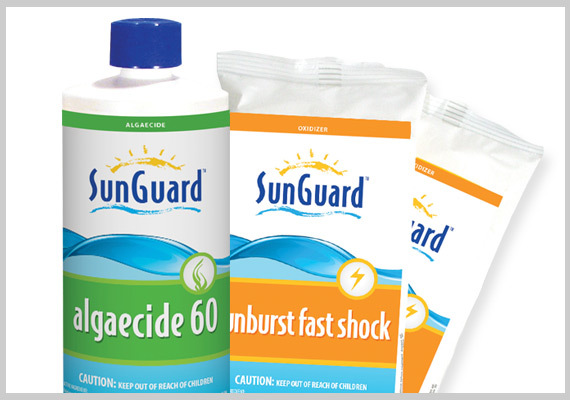 When Hachik needed design for a new product line, MCG Strategic provided just the right amount of ‘splash’. 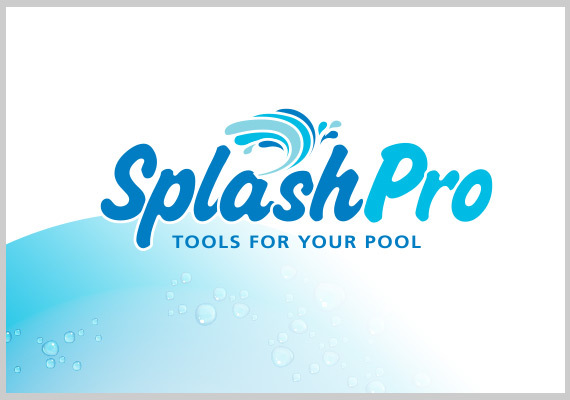 Appealing to a business audience of pool store owners, the new packaging clearly showcases the features of each new product. "A shield… a collegiate feel…crimson, gold and black." MCG Strategic took this direction and developed a comprehensive brand package complete with a guidelines document, over 20 logo variations, stationary, seals, marketing templates and more. 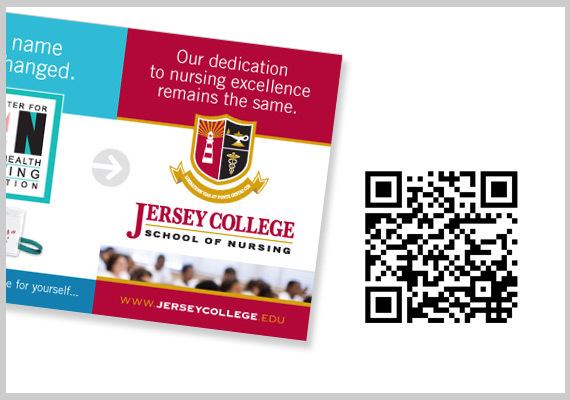 From announcement posters and 16' foyer banners to campus academic catalogs and brochures, Jersey College needed it all. MCG Strategic delivered in a cohesive manner, making sure all materials provided a strong foundation for this new brand launch. Jersey College needed exciting promotional materials to announce its transformation to new college status. Apparel and various imprinted items were produced both for promotional handouts to strategic partners, as well as swag for the store bookstore. MCG Strategic helped coordinate the production with Jersey College vendors to make sure everything was in hand for launch day. 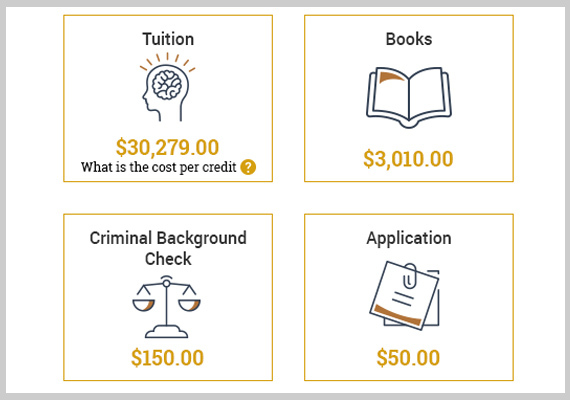 In an effort to be transparent and inform their students, Jersey College engaged MCG Strategic to produce an online tuition calculator that showed all of the expected fees and costs a prospective student could expect when attending Jersey College. MCG Strategic included an administration dashboard within the content management system to offer easy updating of these costs over time. 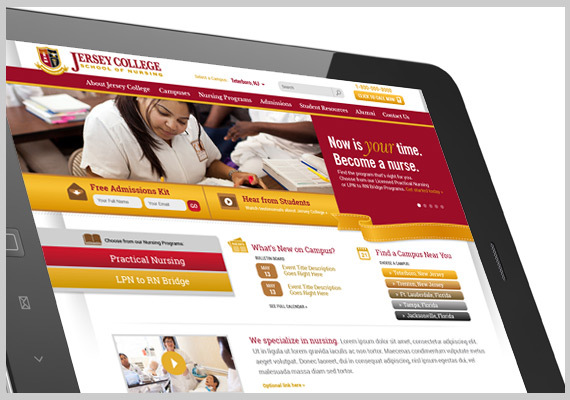 Since Jersey College relies on it's web presence for attracting prospects and aiding in the conversion to enrolled students, the new website's success was paramount. MCG designed and engineered an intuitive, easy-to-use website, utilizing responsive design for optimal viewing on all desktop, tablet and phone devices. Most importantly, MCG Strategic worked in concert with SEO experts, 51 Blocks, to provide a platform for Jersey College's student acquisition needs. Was it a success? In the second month after launch, JerseyCollege.edu acquired twice as many leads as the best-performing pre-launch month of five microsites combined. A+ for effort and achievement. 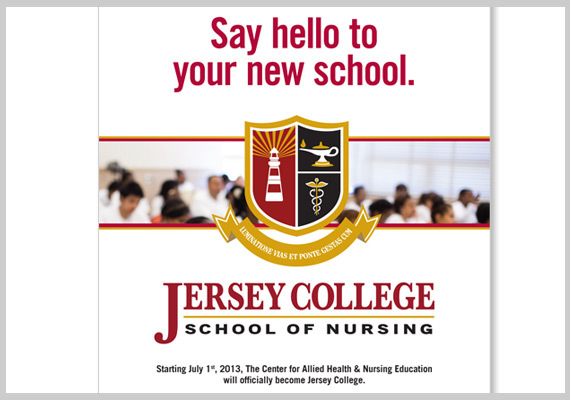 Jersey College has a multitude of marketing vehicles—emails, postcards, mailers, ads—all with different messaging for different programs and campuses targeting different audiences in different regions. MCG Strategic proposed and implemented a QR code tracking system to provide much-needed feedback on the performance of all vehicles across the board. 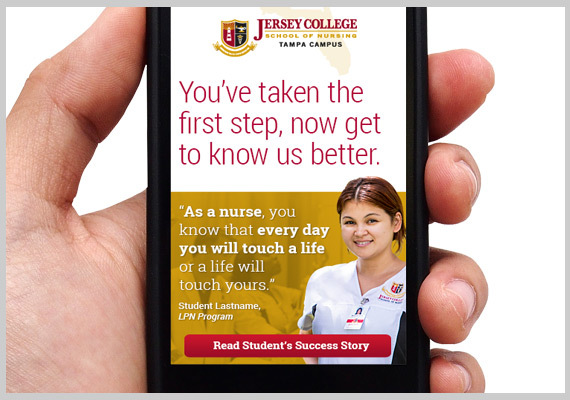 Now, Jersey College can target the right audiences with the right methods at the right time. Efficient and effective. 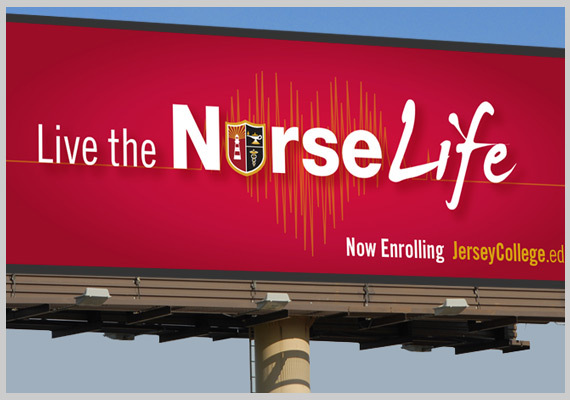 Appealing to who want to save, heal and inspire, the Nurse Life brand creates a foundation for engaging with the Jersey College School of Nursing. MCG Strategic developed the tone, direction and visuals of the brand which has been carried out through multiple marketing vehicles— facebook ads, billboards, emails, direct mail, landing pages and more. MCG Strategic helped Jersey College increase brand visibility by creating rotating digital billboards strategically placed in the high-volume and slow-speed areas of Florida’s highways. MCG Strategic designed and developed a drip email marketing campaign aimed at prospects, featuring graduate testimonial videos and optimized for mobile view. Tied to advanced analytics, these emails and landing pages provide a valuable measure of performance and effectiveness. Jersey College School of Nursing wanted to reach a new audience member— the soon-to-be high school graduate— and introduce them to the idea of a healthy career in nursing. MCG Strategic designed a series of oversized postcards with unique shapes and strong texting call-to-actions to stand out in the mailbox. 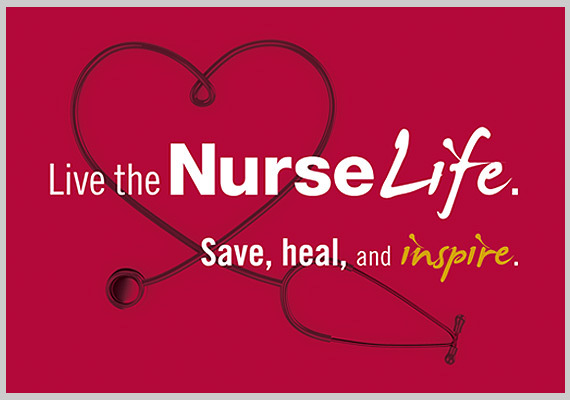 As part of the Nurse Life campaign, MCG Strategic designed and developed a total of 98 remarketing ad variations to meet the wide range of placement and messaging needs. 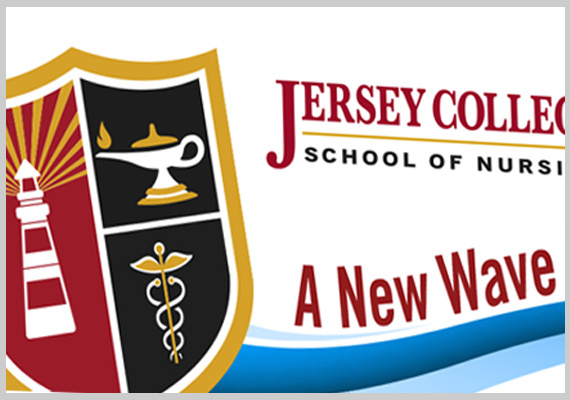 Jersey College School of Nursing is quickly expanding offerings for the post-graduate audience. 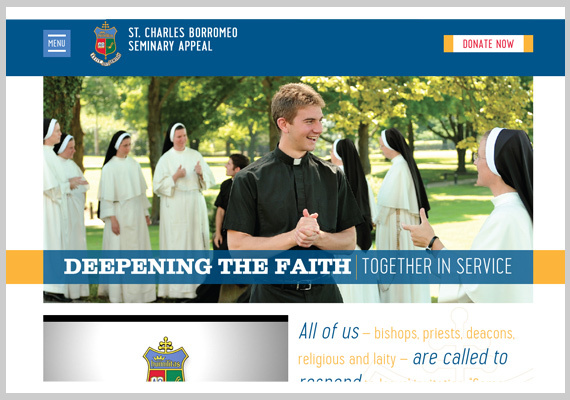 To complement the Jersey College brand, MCG Strategic designed a new college ID package for this sister college. 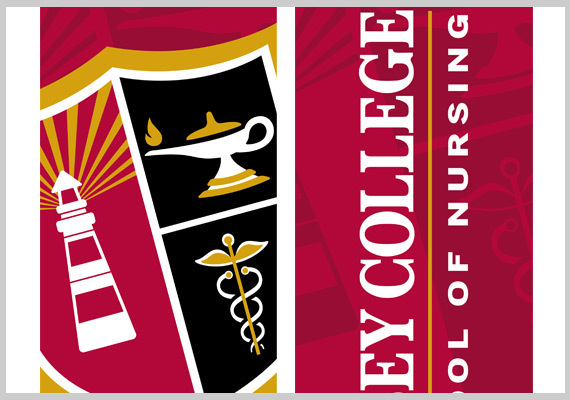 From lighted building signage, to etched glass and fabric avenue banners, MCG Strategic has provided a wide range of outdoor identification for Jersey College School of Nursing’s five campuses. 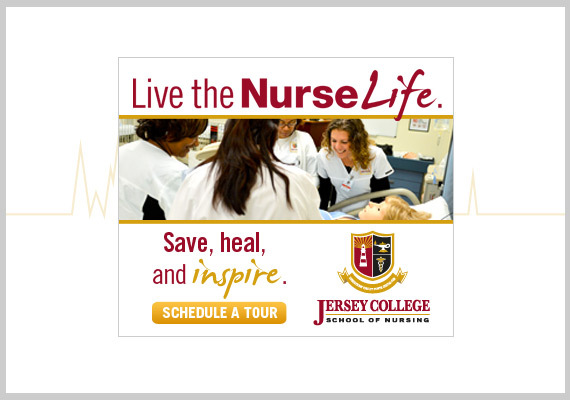 After 18 months of successful promotion, it was time to update the Jersey College NurseLife brand with a new, emotional creative approach across all marketing mediums. 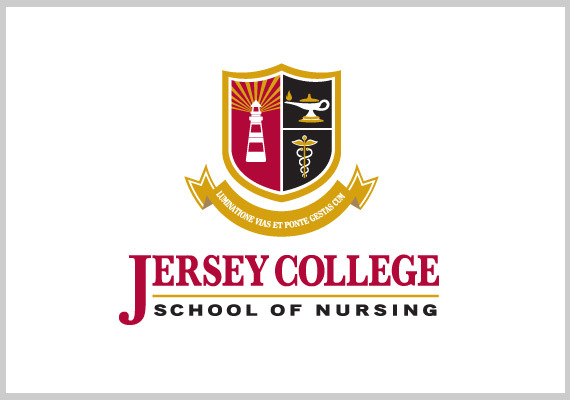 Jersey College recently joined forces with Largo Medical Center for an exciting venture to provide nursing education within the hospital setting. MCG Strategic helped launch this initiative with various digital and print vehicles. Every year we think of a way to share holiday cheer with our friends and clients. In December 2016, MCG Strategic created and engineered a classic whack-a-mole style game for all to enjoy. From frosty arctic characters on enamel pins to a promotional website, Facebook ads, email campaign and of course the app itself, this projects demonstrates our experience across many vehicles. 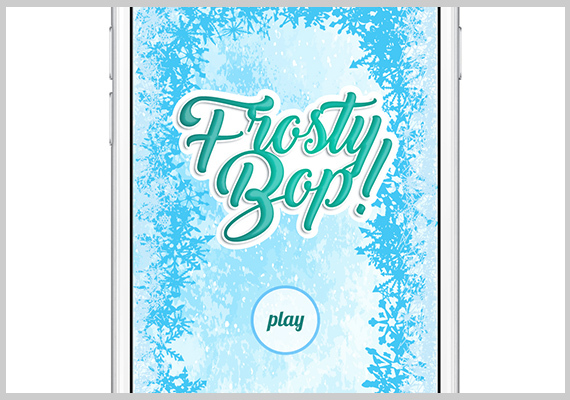 We dare you to download it from the app store and bop your way to a high score before time runs out! We needed to provide clients with a quick an easy way to view and approve project estimates online. So, we built it ourselves! Using our CMS of choice, we built a management and approval interface that simplifies the estimating process for our clients, so we can focus on getting to the job at hand. MCG Strategic implemented enterprise search engine capabilities within the NCBC site to allow site visitors to conveniently search NCBC’s massive repository of PDF documents. The search engine is powered by Apache Solr, an open-source platform. 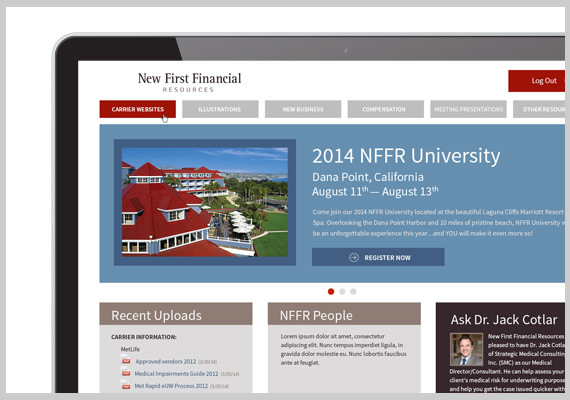 MCG Strategic designed and developed a responsively designed web-based portal supporting file upload, networking and content management for the New First Financial Resources’ member base. MCG Strategic, in alliance with Renavatio Healthcare Communications, designed and engineered Advantage Analyzer—a suite of product comparison tools that provide easy-to-read reports for efficacy, SKU cross reference and surface compatibility for healthcare facility, interventional care and patient care disinfectant products. Saint-Gobain hired MCG Strategic to design and develop a mobile app that allowed their employees to track various recommended healthy activities on a daily basis. 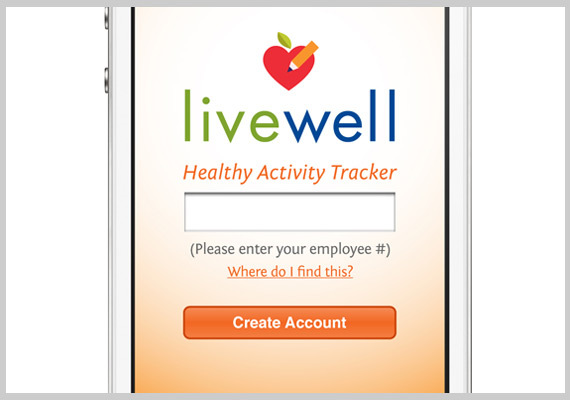 The app communicates with a central database and stores each employee's activity progress for later analysis. This data allows Saint-Gobain to offer rewards and identify employee trends. MCG Strategic provided SaaS Capital with a new, mobile-ready, responsive presentation to keep on top of modern technology and to ensure organic SEO results that perform. MCG Strategic designed this InDesign template for distributing data to clients and prospects, in both digital and print format. 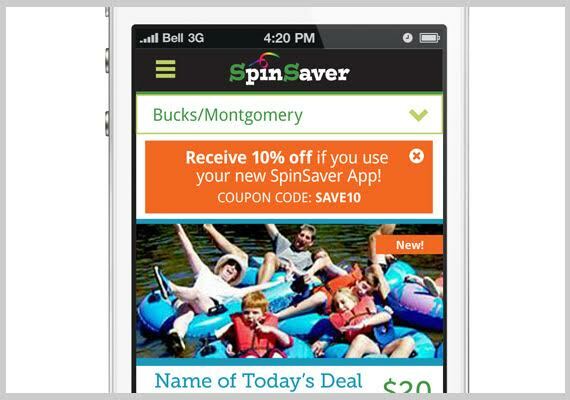 SpinSaver needed an iOS and Android-friendly app for merchants to compete on the level of Groupon. With a QR code voucher scanner, this mobile app allows merchants to easily track customer total spend and measure the overall success of their deals, quickly and easily. A story of success for SpinSaver. To compete with Groupon and LivingSocial, at a local level, SpinSaver turned to MCG Strategic to design and develop a consumer-focused app. SpinSaver users can quickly find deals in their area, purchase vouchers and even send gifts to friends. With the customer's deals conveniently stored in their app, SpinSaver merchants can easily redeem vouchers with app-to-app scanning. Synergy Events was not looking to completely reinvent themselves, but wanted to evolve, and this busy events and PR agency needed someone to focus on them while they kept their eyes on their clients. MCG Strategic gave a fresh face to their logo mark and engineered a responsively designed site with large images to showcase the Synergy team excitement. 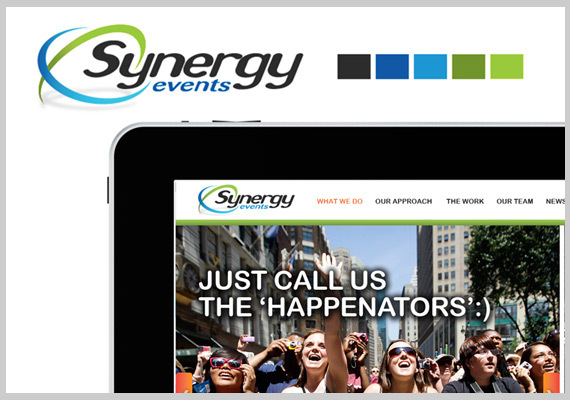 Content-managed and mobile-friendly, SynergyEvents.com delivers big brands in a big way. Synergy Events needed an online business solution that would allow simple sharing of (often very large) files and plan documents with their clients and vendors. Leveraging custom components and the Concrete5 open source content management system, MCG built a flexible framework and easy user interface that not only allowed file sharing, but also alerts, workflow and full control and customization. Increased efficiencies, smoother internal and external communication makes for a happy client (and their clients) at Synergy. MCG Strategic helped TASC improve the user experience of their FSA benefits platform servicing over 500,000 users by streamlining the user interface, and assisting with smart engineering to interface with TASC’s various databases, platforms and frameworks in a flexible, mobile approach has resulted in a new offering touting increased customer satisfaction. MCG Strategic created a vibrant logo and a mobile-ready site to highlight the efforts, and provided an online document repository for members to easily share information. 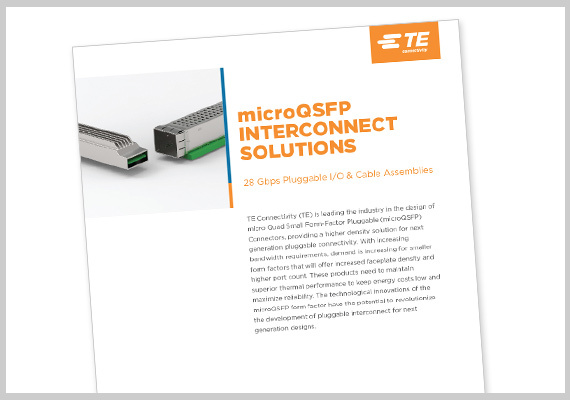 MCG Strategic designed a complementary product brochure to highlight the microQSFP line of connectors. MCG Strategic developed unified marketing elements including key visuals, booth graphics, email marketing, bag stuffer, PowerPoint template and web assets to promote TE Data & Devices at a key industry trade show event. 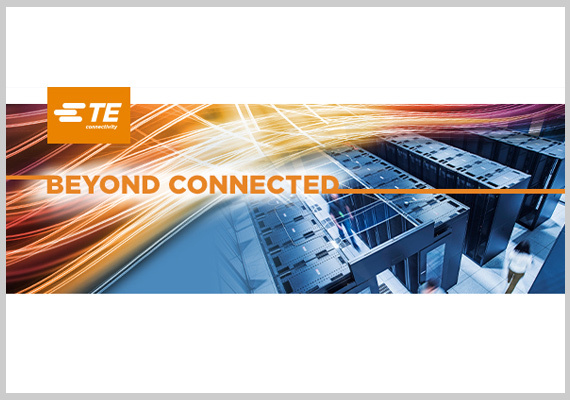 When TE Connectivity needed to launch their Data Center Solutions campaign, MCG Strategic developed key visuals, web assets, banner ads and white paper materials to promote the broad range of solutions to international audiences. MCG Strategic launched a unique Think and Do Tank for The Stell Institute that has quickly become a premier resource and knowledgebase for companies looking to implement Corporate Social Responsibility (CSR) programs in their organization. Built for growth, the website was implemented with an enterprise content management system that supports Satell’s roadmap for providing membership-based resources, content and corporate mentorship in CSR. MCG Strategic designed a whitepaper system for The Satell Institute to highlight key information in the CSR world to be printed and digitally shared. Custom delivery options, easy product management and robust ordering are all presented with a streamlined visual design in this mobile-ready shopping experience. MCG Strategic was formed with the goal of providing branding, strategic marketing and worldclass creative and technology-driven solutions for clients striving to grow and conduct business with innovation and a progressive vision. Since its inception in 2010, MCG has produced work for regional, national and global businesses in a variety of industries; from technology, B2B and financial to healthcare, education and retail. 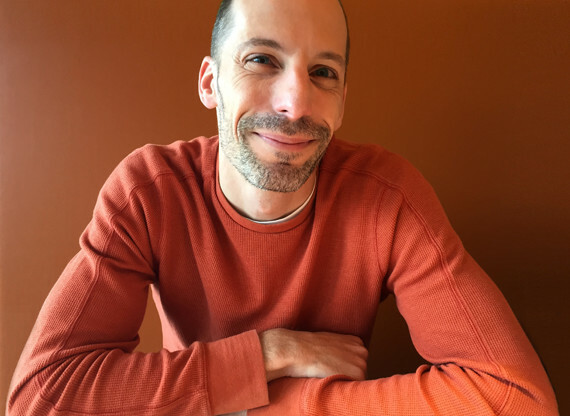 Joe has over 18 years experience as a technology leader in the corporate marketing industry, having produced award-winning work as Director of Technology for several Philadelphia-based agencies. An entrepreneur by nature, Joe founded MCG Strategic in 2010 with the goal of providing branding, strategic marketing, technology-driven solutions and world-class creative for clients striving to grow and conduct business with innovation and progressive vision. His enthusiastic leadership enables companies of all sizes to harness the instruments needed to be a competitive player in today's technology-driven business environments. Joe graduated from The University of the Arts in Philadelphia with Honors. 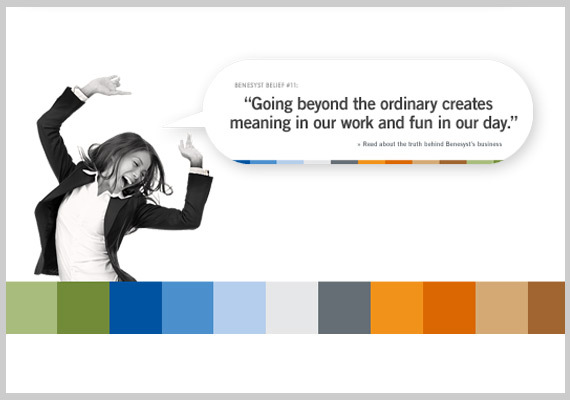 Lisa leads the creative vision at MCG Strategic with over 17 years of advertising, design and interactive experience. As Creative Director, Interactive Director and Brand Consultant she has conceptualized and created countless high-profile campaigns and brand marketing vehicles for clients in the Financial, B2B, Healthcare/Pharma, Education, Technology, Real Estate and Retail industries. Lisa's talents have been recognized via ADDY awards, Philly Gold awards, and as a finalist in the International One Show Interactive Annual Awards. Lisa holds a Bachelor's degree in Scientific Illustration and Graphic Design and has completed graduate work in web development at Moore College of Art. Lisa has taught professional classes in Web Usability, User Experience & Information Architecture and Social Media. "I wake up at night from a nightmare where we didn't hire MCG for this project." "I just want to say thank you. I appreciate your creativity and dedication. It's going to be awesome… nobody's going to be able to touch us." Think we may be a good fit for your needs? We'd love to hear from you.